Food plants for the larvae are members of the family Rutaceae. Mature larvae 62 mm long, usually green, some yellowish-white markings; head dark brown. 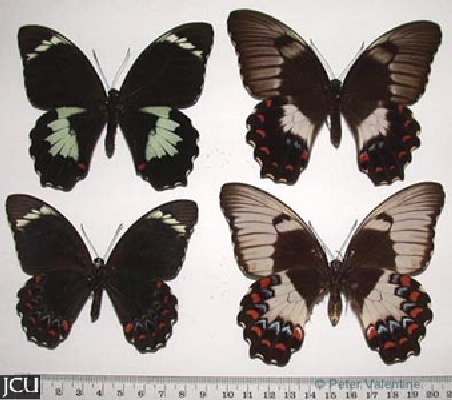 Adult male upper surface black with subapical band of white spots, broad cream patch on hind wing and red spot towards lower margin; lower surface similar but series of subterminal crescents present. Adult female has a brown-black upper surface which margin whitish-grey, series of blue and red crescentic subterminal markings on hind wing; lower surface similar to upper but blue spots more distinct.